SALE/DISCONTINUED There are 3 products. 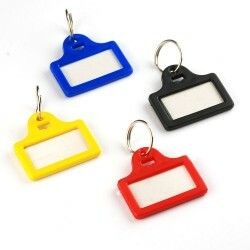 Miniature plastic key tags, complete with paper insert protected by a clear plastic cover and a coiled ring. 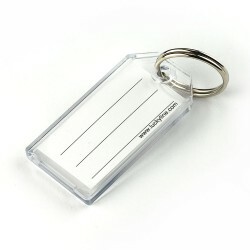 Heavy duty, clear plastic key tag of a high quality. Supplied with a paper insert for labelling and a durable nickel-plated split ring. Durable key tags with coloured plastic cover and nickel plated ball chain, ideal for keys or luggage. Two tags per package.